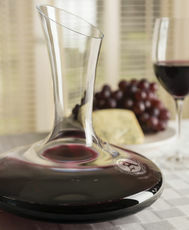 A decanter is a vessel that is used to house and pour wine and they make a great presentation for any sort of occasion. While they vary in shape and design, they have played an important role in how wine is served throughout time. According to Wikipedia, "the Ancient Romans pioneered the use of glass as a material and the Venetians reintroduced glass decanters during the Renaissance period and pioneered the style of a long slender neck that opens to a wide body, increasing the exposed surface area of the wine, allowing it to react with air." At The Stationery Studio, our monogrammed decanters offer an attractive way to store and display your adult beverage of choice. These clear glass containers add just the right amount of sparkle and elegance to your bar or the beverage counter at a friend's home. The curves of our monogrammed whiskey decanters are set off by the intricately shaped stopper, and the decanter's nice sized capacity is just right for holding your favorite bottle of whiskey. When you need an elegant gift or a beautiful new addition to your set of bar ware, our monogrammed, diamond-cut whiskey decanter is an excellent choice. The intricate detailing on the decanter's base allows the glass to sparkle, complementing the shine of your customized lettering. This decanter is hand blown and made of lead-free crystal. 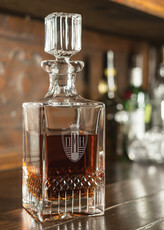 Tight craftsmanship and a restrained hand-cut pattern lend simple elegance to our of this exquisite decanter. Our deep-etched glass decanter is a vision of beauty. Another fun gift idea, or even something great to add to your own collection for entertaining is a personalized distillery set. These sets include a growler and four matching low ball glasses and are just right for the whiskey aficionado on your gift list. You select the imprint or monogram to go on the set making it the perfect gift for an anniversary, a birthday or the holidays.